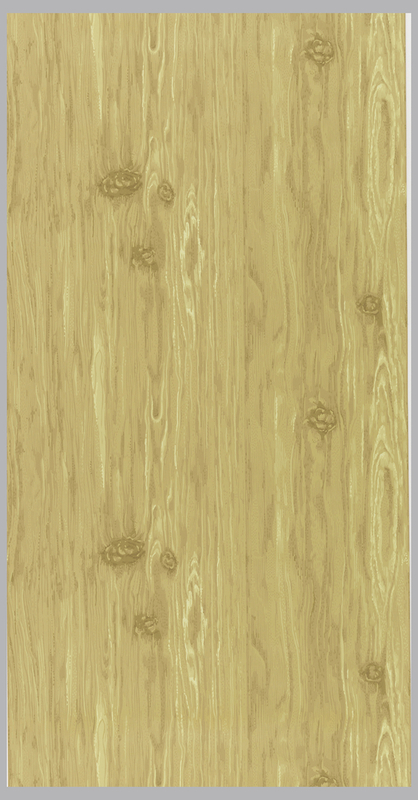 I have always admired a good woodgrain wallpaper. Woodgrain or faux bois wallpapers have been around almost as long as wallpaper itself and the Cooper Hewitt collection has examples printed in almost every technique including hand painted, woodblock, lithograph, machine and even self-adhesive vinyl. This particular design has always caught my eye as I think it is so well done. This is an inexpensive machine-printed paper produced in the 1950s which came pre-trimmed to make hanging easier for the do-it-yourself market. The designer and/or manufacturer just got it right, from the design of the pattern to the selection of the colors. Historically wallpapers copied rare and exotic woods which, before the days of micro-thin veneers, made it much easier to hang the wood imitation than the real thing. The wallpaper also made it possible to cover surfaces that would be difficult to do with wood, such as curved walls or columns. As the cost to cover the walls with exotic wood panels would be high I’m sure these quality imitations were a welcome substitution. Many of these early papers were further embellished with imitations of gilt bronze mounts or served as the backdrop for trompe l’oeil statues or floral bouquets. In the 20th century woodgrain papers became less formal and began copying more familiar woods such as oak, walnut, and pine, as you see here. These were usually produced as a cheaper alternative to decorating with actual wood. I have noticed a trend recently of designs becoming more formal with papers copying elaborate panel moldings, such as might be found in a French chateau. Some of these are drawn in a loose, gestural style which gives them a more casual feel. Needless to say I’m quite fond of this new trend.